‘You don’t look like a Pastors wife’. I wonder is it because I wear make up, say the wrong thing on occasion, roll my eyes too often, laugh at the wrong time during conferences? What springs to mind? Here’s the stereotypical criteria I have realized. Smile continually and produce lots of perfect children by pain-free supernatural childbirth. Play piano, sing like an angel, work in the church nursery. Organize women’s events and carry an endless supply of Kleenex. Produce a real baby Jesus if one isn’t available for the nativity. There’s more but you get the idea. I came to realize a long time ago that I’d never meet the criteria and as Pastor’s wife I would be not allowing other people’s expectations to define me. Because in being me, I am honouring the one who created me. Unique and precious in His sight. Don’t get me wrong, I know lots of piano playing, sensitive, singing PWs and that is who they are meant to be. It’s not about rebelling against stereotypes and trying to be cool. Lay off on the expectations, throw lots of grace her way and bless who she is. And I’ll end with this. 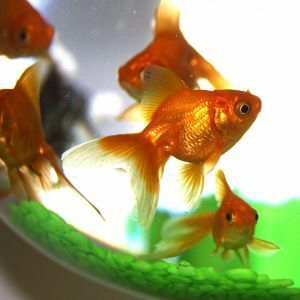 If I’m made to live a goldfish bowl. Please throw me some food in occasionally. I am joining the free writers over here today. My friend Melissa also wrote a beauty today. Read her blog here…she’s a legen…I mean I really love her. This is awesome! I would love to also see “Confessions of a Pastor’s Kid”. Got a million stories. Keep on being who you are, Michelle. A good looking, out there pastor’s wife with a soft heart and wonderful humour. I’m not near enough to throw you some food, but I bless you today with insight, encouragement, confidence and favour. Amen! So much truth in this message! Thanks Jen. Authentic living.. a truth for us all. This is wonderful! And I’m in complete agreement with you – the expectations placed on pastors’ wives are ginormous and totally unfair, to say nothing of unrealistic! I have the same yet opposite problem in that my spouse is a pastor’s husband! Good luck with that one, right?? Thanks for reading. I read this week ‘expectations can be the biggest killjoy’ Here’s to us PWs (and PHs) being ourselves! So when you say, “Throw me some food.” do you mean it literally? Lol, I’m pretty good at baking. 🙂 Just wanted to tell you, I’ve volunteered in Sunday School with your middle daughter and she is absolutely lovely! Ha. I’ll leave you to interpret 😉 Thanks for volunteering. We appreciate you! what is seen on the outside. Keep on seeing and hearing with the eyes and ears of your gentle heart, you’re are doing wonderfully well! Some food from your momma Shell……love in abundance, blessings, admiration,, respect, laughter…..the joy of the Lord…….rainbows…..the list goes on…..
Once again words of honesty and wisdom from my very blessed and beautiful daughter…..
LOOOOOOK how many comments you got. Clever girl. I love this piece. Honesty. Gets my vote. Short, sweet, very entertaining and very truthful. Well written. Thanks Jo my encourager. Loads of love. Can’t wait to see y’all.